In my previous piece, I discussed how we are undergoing a process of rebooting the game into EVE 2.0, and how all of this is happening in a live, highly competitive environment. Today, I would like to dive a bit into why this is important. EVE is actually two things. EVE Universe, the intellectual property (IP): the characters, back-story, and virtual universe that was originally created to support the software game. EVE Online, the software: the game that users play out a fantasy of futuristic dystopian space-godhood. Both aspects are important to EVE’s success. A focus on the IP allows the story to reach a wider audience and creates a stronger brand loyalty. This allows CCP to do new projects and present the whole as a more fully fleshed out creation. Consider the books CCP has made that range from EVE Source to Templar One to the recent comic book about the fall of BoB. As in that last example, it’s important to remember that EVE Online is centered around player driven content, as CCP Seagull has reinforced with her recent dev blog, distinct from the theme-park focus on story points seen in other MMOs. EVE sits in a potentially volatile niche. When CCP puts too much effort outside of the spaceship game then things become risky. The Summer of Rage was a great turning point and probably needed to happen. The loss of trust that resulted went both ways though, as CCP realized how difficult it is to rest their business on the happiness of their EVE Online players. Dust 514 was an attempt to widen their player-base, but it failed. They have another opportunity to do it right, and they know the pressure is on. The Oculus Rift release date is set to be in Q1 of next year, and Valkyrie is set to be a release title for it. This is going to expose a staggering number of people to EVE. However, Valkyrie is not tied to the EVE Online game, only the Eve Universe IP. Valkyrie will have a very different experience than EVE Online, as it has totally different design goals. I am sure many of the high level design strategies and philosophy will remain similar, but the game itself will be a new lens into the EVE Universe through a narrative story. 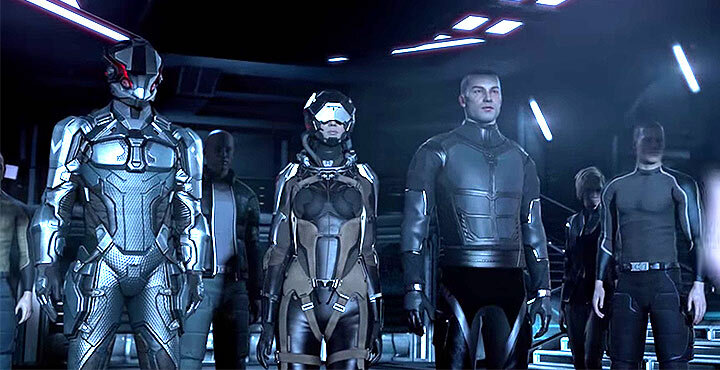 When Dust 514 was ramping up to launch, CCP heralded it as something that would put the EVE Universe on the map. It would be revolutionary, and they could use that to drive people into EVE Online. Valkyrie stands to deliver what Dust promised to be: an ambitious additional project in the EVE Universe that will bring millions of eyes to the beauty of our universe in ways that many of the players of EVE Online don’t even understand. People who like Valkyrie and its story will be drawn to the books and other EVE Universe material, and some of them will be sucked into our little sandbox. Many won’t, and that is OK; this game isn’t for everyone, and shouldn’t be. However, even those who do not come to EVE Online are still giving CCP money. They are providing the additional stability CCP needs for the EVE Universe to flourish. The tide of success, as they say, raises all ships. The number of people who join EVE Online from exposure to the wider EVE Universe, and stick with it, will be directly controlled by how good they can make EVE Online before that deadline. That release could potentially be so large and important that we will look back and wonder as to how we ever got by in the “old days”. It is an ambitious goal, but not an impossible one. Which brings me to CCP’s currently fourth known project: Gunjack. Now this one is a bit less well known, so I will introduce it for anyone who may not be caught up. Gunjack is a new VR game being introduced out of “Project Nemesis”. In Valkyrie you are the pilot of a fighter; in Gunjack you are a gunner on a mining barge. Mobility is low as you are not in control of the ship’s movement, only your own turret’s movement within your arc of fire. 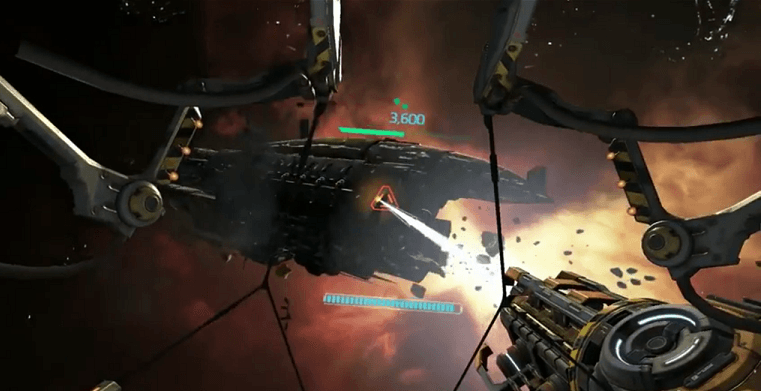 Gunjack is being published with Samsung as a premium game for their new Samsung Gear VR platform. I have seen some criticism that Gunjack is a dumbed down version of Valkyrie, but the critics are missing the point. All storytelling and artistic vision must be adapted to the challenges of the media in which they are conveyed. It may seem that both Gunjack and Valkyrie are VR shooters and so should function the same, but as a designer you have one huge difference: hand input. With Gear VR, you do not have to plug into anything, it is VR on the go. There doesn’t have to be a controller input. So how would you control navigation? Your vision also controls your guns, to shoot at something you simply look at it and hit a button on the side of the device on your head. So you have to design around that and scale your game down a bit. Not all exposures to the IP should be on the same god-like scale of EVE Online players. I encourage Gunjack, and other projects that bring exposure to the Eve Universe IP. Recent developments in the lore have been quite exciting, and have brought a newfound interest and profound growth within the lore community. CCP could easily expand their living universe moving forward with these games. CCP has a deep passion for EVE Online, and I feel that any success of the EVE Universe is a success for EVE Online Before I conclude, I would also like to address the return of expansions. This is not so much of a release change as it is a marketing change. When CCP started the fast-release cycle, one problem that was discussed was that new trailers would be rarer or different, since we would stop having our regular expansion trailer/launcher change. The expansions brought a rhythm, along with restrictions. At the time, CCP hand waved it away, saying that they would still have those things when appropriate, and to their credit, they have for the most part. The problem that was without expansions changes felt like they happened sporadically rather than thematically. At the time this problem wasn’t actually an issue because EVE Online wasn’t ready yet. Now that we are getting to the end of the roadmap it is time to readdress the issue. So releases of content will happen in five week cycles as they have before. However, these will be lumped together along with bigger feature deliveries when thematically appropriate to brand as an expansion. All this tells me is they are reinvigorating their marketing wing, getting them ready to expose the EVE Universe to a bigger world. 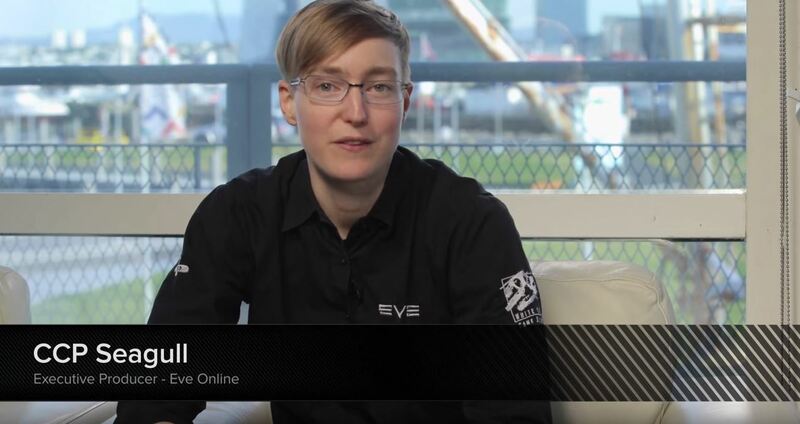 EVE Online will always be the core of the EVE Universe and core to EVE’s success. But it will be the core of a bigger universe with Dust, Valkyrie, Gunjack and other IP offerings we don’t even know about yet. This is a more fully-fleshed out vision than EVE Online could be alone, and it makes Eve Online stronger. Get ready for EVE 2.0, it’s almost time to go live.